Nationwide performer Paul Mills aka POEZ ("A spoken-word pioneer" - NY TIMES) has been a pioneering spoken-word singer-songwriter, and audio and video recording artist, since 1976. For your event Poez will perform interweaving lyrical, dramatic poem songs, by classic poets (Robert Frost, Emily Dickinson, Coleridge, others), original or improvised poetry, accompanying himself on keyboard, or with digital delay enhancement. 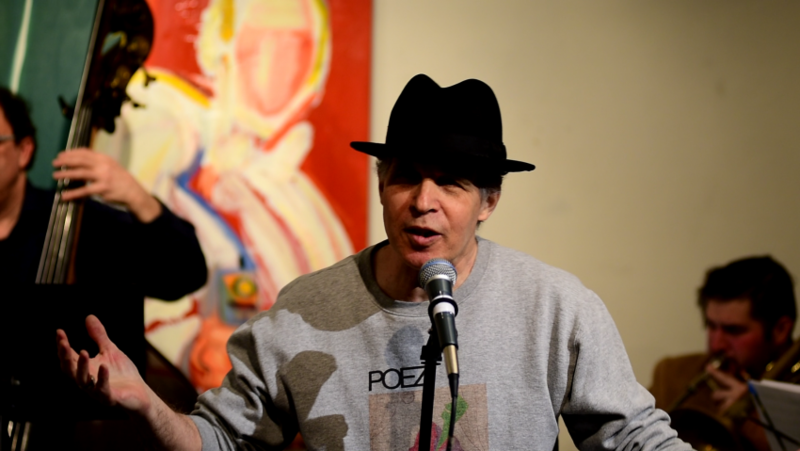 He has shared bills with poets such as Laurie Anderson and William Burroughs, among many others, at New York's Bitter End, City Winery, St. Mark's Poetry Project, Bowery Poetry Club, in SF, Boston, London, Paris, on radio and TV. "Astonishing" - Le Figaro (Paris). He was great, i would recommend him and book him again. If you like poetry this is the guy to book. Dinner party with charming people and awesome artwork on the walls. We started off with a brief piano interlude of original jazz, then the classic poem, "The Road Not Taken" by Robert Frost, and an original, "I Wanna Sleep With A Genius!" "Annabel Lee" by Edgar Allan Poe. Another time perhaps I could do an improvisation and use the digital delay. Me, costumed as in the attached photos, and bearing in hand the Poetry Menu. The Poetry Menu lists classic poetry by Coleridge, Poe, Dylan Thomas, Emily Dickinson, John Keats, Lewis Carroll, Rudyard Kipling, William Butler Yeats, Robert Frost, Walt Whitman, as well as my own original titles. 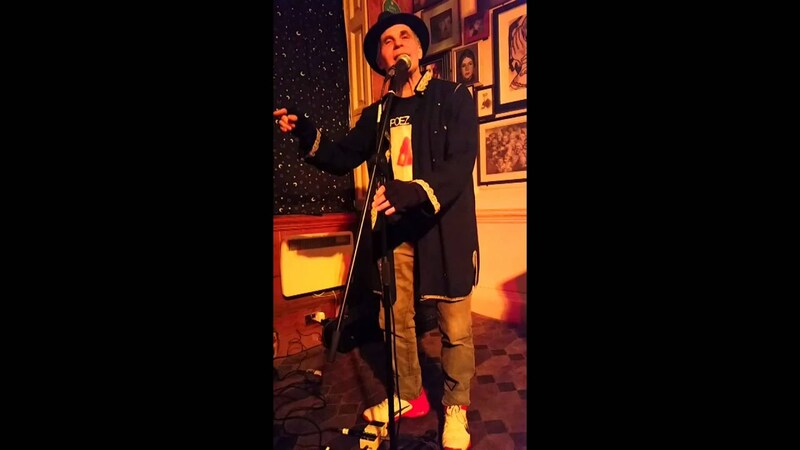 Your guests pick the poems, I perform them on the spot, dramatically, from memory, with or without a microphone. I can do these things if you like: Perform classic poems like "The Raven" and many others, as you or your guests can select from my "Poetry Menu" (I think there's a picture of it in my photo section on this website). Or I can do improvisation based on audience suggestions. Original poetry, with or without digital delay enhancement, with or without keyboard. Do you have a piano? I have a little amp that's not much trouble. Recognized by The New York Times as "a spoken word pioneer", his career trajectory has taken Paul L. Mills aka Poez from the sidewalks of Boston's Harvard Square and Greenwich Village to concert stages in Paris and New York, radio and television in New York, Boston, Prague. There has really never been anyone else quite like him. "A sonic fantasia," said The New York Times in a prior review. 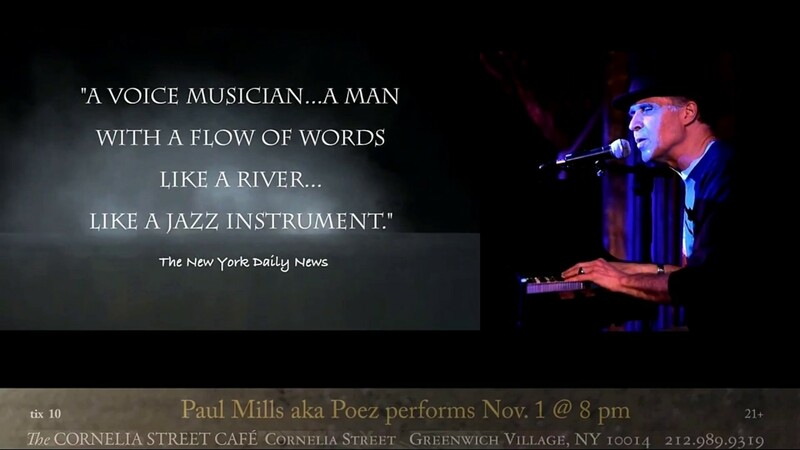 "A voice musician ... a young man with a flow of words like a river ... like a jazz instrument" is how The New York Daily News described Paul L. Mills aka Poez. 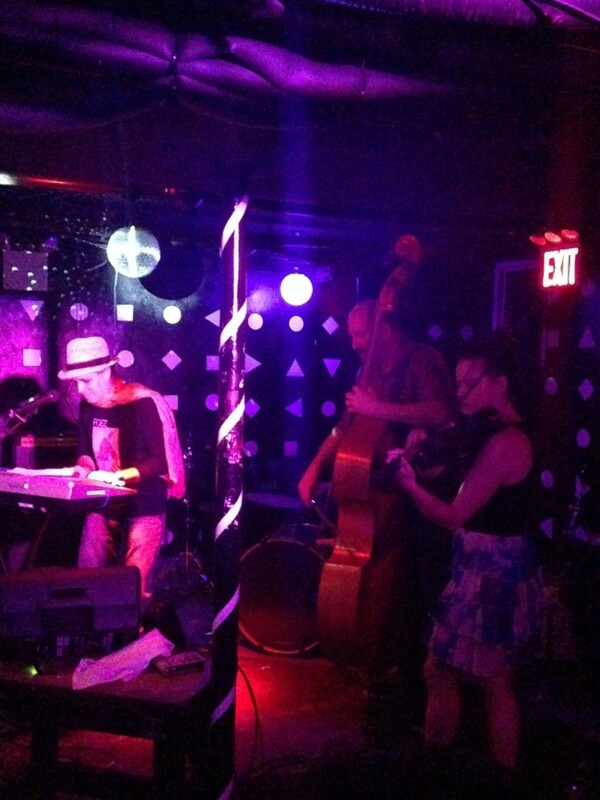 "Plays his voice as a violinist moves the bow across the strings ... beyond the writing, beyond the performing, to a personal portrayal that is a virtual song" The Aquarian Weekly. "An astonishing and unexpected voice," were the words used by Le Figaro (Paris), "Incredible and extraodinary ... words suddenly become rhythm and music" agreed Le Quotidien (Paris), of his concert engagement at Le Theatre du Rond-Point on the Champs-Elysees in Paris, when Patrice Regnier's RUSH Dance Company joined him in live performance of his original work, "Spontaneous Combustion." He has performed in New York at, among other venues, The Bitter End, Kenny's Castaways, Theater for the New City, the Ridiculous Theater, LaMama ETC, the Cornelia Street Cafe, the Bowery Poetry Club, and the Sidewalk Cafe/Anti-Folk Festival, as well as in radio and television appearances, sharing the bill with performers such as Mose Allison, Sonny Terry & Brownie McGee, William Burroughs, and Richard Hell. His writing has been published in Boston's Fusion Magazine, along with that of Lou Reed, Patti Smith guitarist Lenny Kaye, New Yorker essayist Hendrik Hertzberg, and UK television personality Loyd Grossman. He has worked at times as a cab driver, civil rights trial lawyer, actor, bouncer, and philosophy book salesman; lived in Washington, DC; Highland Park, Illinois; Marblehead, Massachusetts; San Francisco; Los Angeles; and Albuquerque, New Mexico. Artistic influences include Indian Dhrupad singers The Dagar Brothers; comedian Lenny Bruce; poet Dylan Thomas; the Firesign Theater; poet Amiri Baraka; and jazz vocalist Mose Allison. Paul L. Mills aka Poez presently resides in New York City near Central Park with his wife, singer-songwriter Suzanne Vega. A collection of selected writings, THE POETRY DOLLARS (Bowery Books, New York, 2007), is available online at (link hidden) and will be on sale at this show. His CD, "The Monotone," is now available on iTunes and will be on sale at this show. As a spoken word artist, I can adapt to your available setting. If you have a stage, microphone, amplifier, lighting, all the better. But a quiet room with comfortable chairs for the audience works fine too. A glass of water might be helpful. Optional: stand-up or hand-held microphone.